The moment Luis Enrique rung the doorbell to the tall, green house my stomach dropped in anticipation. What would they be like, my host family for the week? Would they speak any English? Or would they understand my Rosetta Stone beginner level Spanish? Would the house be comfortable? Would I feel awkward and uncomfortable? All these thoughts loomed my head as I waited and waited for the door to open. It felt like an eternity. Finally after a couple more rings, the door opened. I secretly gave a sigh of relief. I was tired, dirty and hungry. 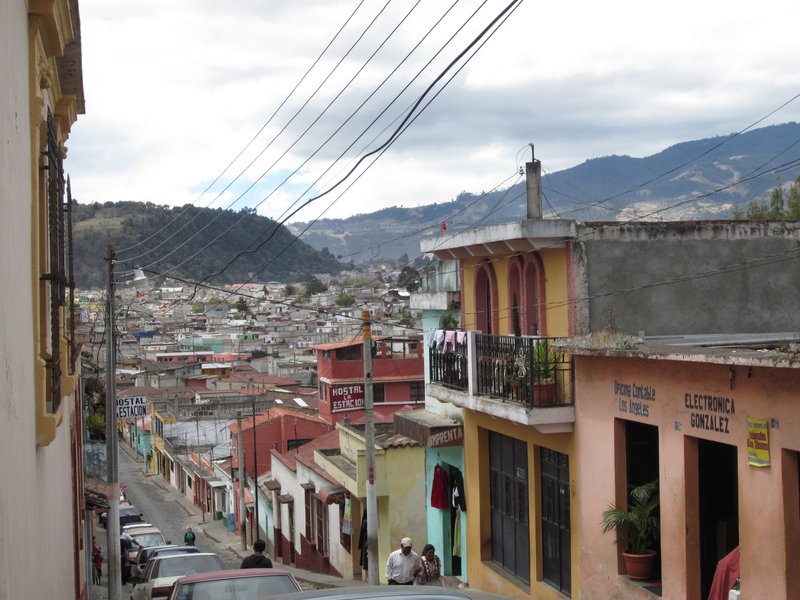 Plus I was eager to meet my new host family who I had heard all about from Ms. May, my son’s school teacher back home who runs the exchange program for Casa Xelaju. The door creaked open and a dog barked. A young man answered the door and some words were exchanged briefly in gunfire Spanish. All I understood was “Nicole” (my name), “si” and “uno momento por favor”. I entered the dark house to silence and pulling in my enormous red suitcase. I was told to wait there for a moment in the long, narrow hallway, and there I stood for another five minutes waiting for the matron of the house. Five minutes later of awkwardly waiting alone in a strange, unlit house the young man, named Cristian, returned again. He showed me my room for the week and explained that his parents were not home at the moment. I pulled my red suitcase inside my small, comfortable room and began to settle in. Cristian had informed me that the house had WIFI which was a pleasant surprise. I had brought my trustworthy iPad along on the trip so I could keep current on emails and use it to Skype my family back home. I didn’t bring a cell phone so you can imagine the relief when I was able to call my husband Paul at home and let him know that I had safely arrived. The kids said hello and the usual “I love you’s” all making my exhausted emotions drain. 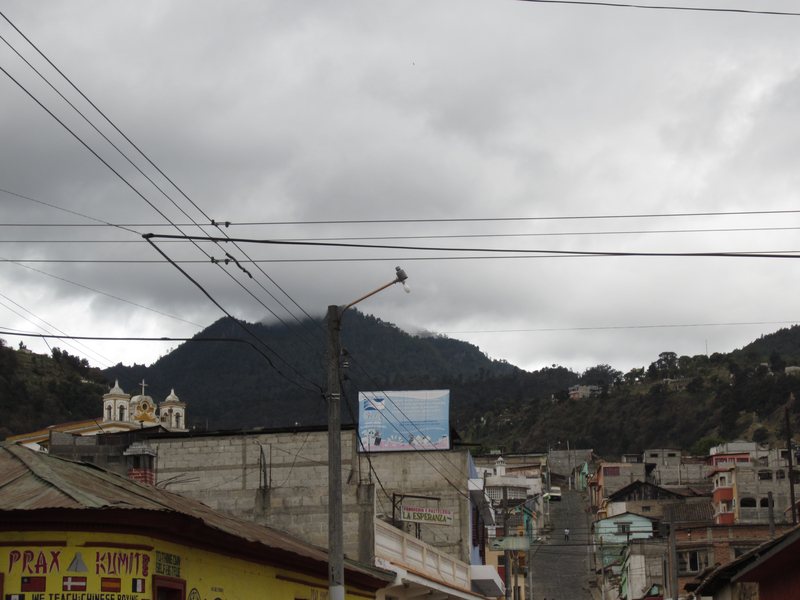 I felt alone and confused, wondering what on earth I was doing in Guatemala in this strange bedroom far away from the comforts of home. Thankfully as a well-versed traveler, I knew that I was going through the initial culture shock that I always experience upon arriving in a new place. After so much excitement, anticipation and planning surrounding a trip, I always feel this crazy letdown the moment I finally arrive. It is natural and human, so I know enough now to not let it bother me. It always only last a couple of days and unfortunately when it is a short trip, that means it is almost time to go home by the time I’ve fully adjusted to my new surroundings and am settled in. It was approaching eight o’clock and there was still no sign of the family. I was beginning to get really hungry as we normally eat insanely early back home because of the kids. Finally, I heard some commotion and peered outside of my bedroom door to see Sondra and Sergio, the patrons of the home, walk in the door to greet me. They were warm, friendly and full of life and energy. Exactly the kind of people I adore spending time with! They graciously welcomed me to their home and told me that dinner would be ready in a little while. 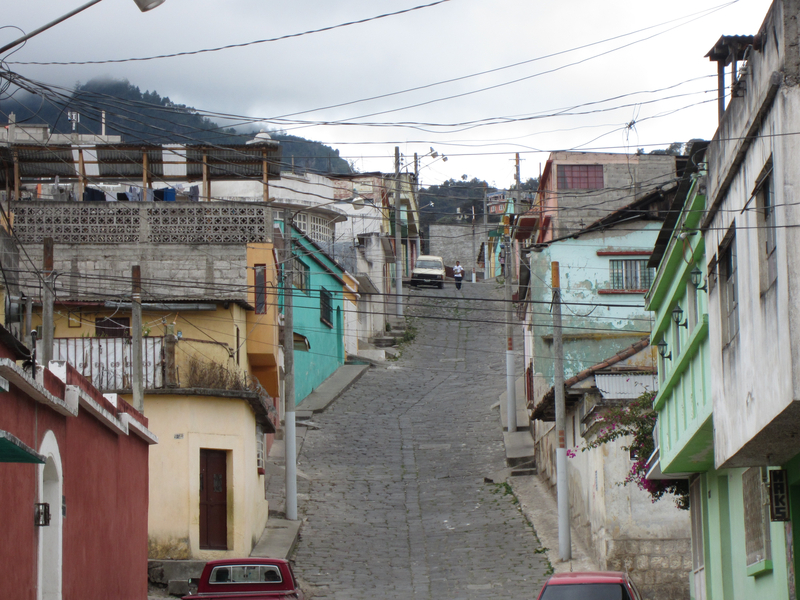 By 8:45 pm, the typical time for “la cena” in Guatemala, the rest of the family began to arrive and it was a rather large group of people which startled me. 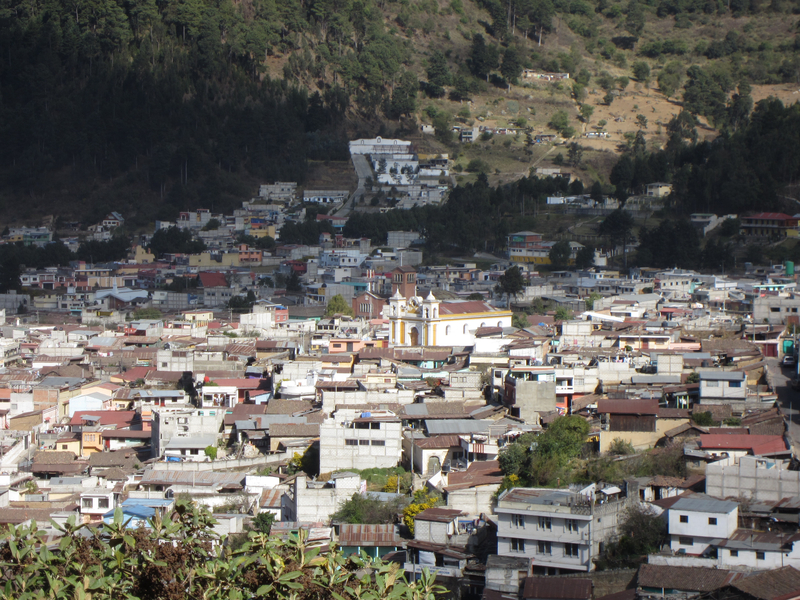 Around one small table sat, me, Sondra, Sergio, their three sons (ages 14, 19, and 22), their daughter-in-law and two other Guatemala students who were living there and renting space. It was quite a large, lively group of people and let me tell you, the conversation was unstoppable. I think in the first thirty minutes I understood maybe one or two words. Their Spanish darted around the table like a racehorse and I could hardly keep track of all the changes, nor could my head. I turned left, then right than across then next to me, moving so fast that as soon as I got there and listened to someone talk, the conversation had already moved to someone else. It was a hard, lonely place to be! For I LOVE to talk! I make friends with anyone, anywhere. Yet the language barrier that night was so huge I could hardly say a thing. I felt like an idiot! Yet I tried not to let it get me down or too stressed out. For what did I expect? I was a French major not Spanish and have not seriously studied Spanish for at least eight years! Although the food was very good and the family was delightful, it was too much for me the first night. An hour later, after the meal was complete and it was approaching ten, everyone said their “buen provecho” (which I found confusing because it means “enjoy your meal” or “good appetite” and it is said after you have eaten!) and “buenos noches” and were on their way. I went to bed praying that tomorrow would be better. It wouldn’t be so hard. I would be able to talk with these wonderful people and I would love it here! I fell asleep quickly to the sounds of a busy house. Grand view of the city from up above. 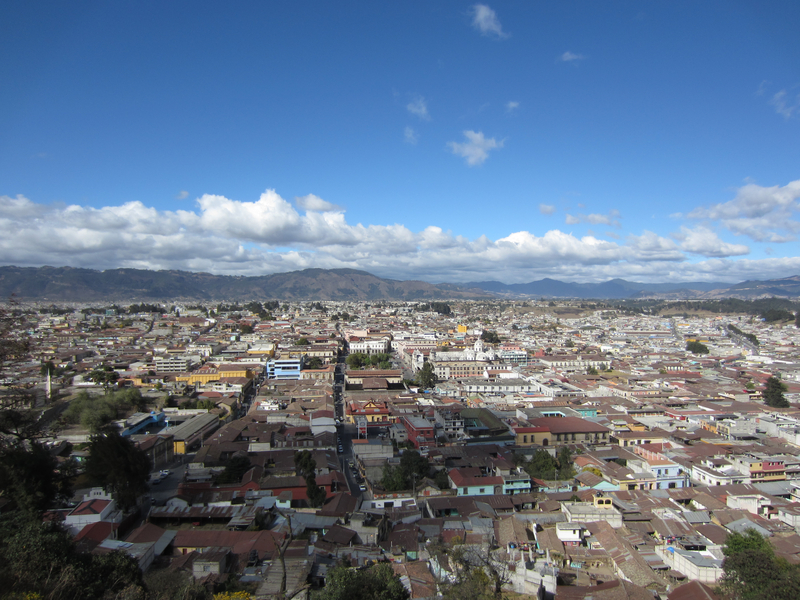 I love this picture of Xela, especially the gorgeous yellow church that pokes out off in the distance! 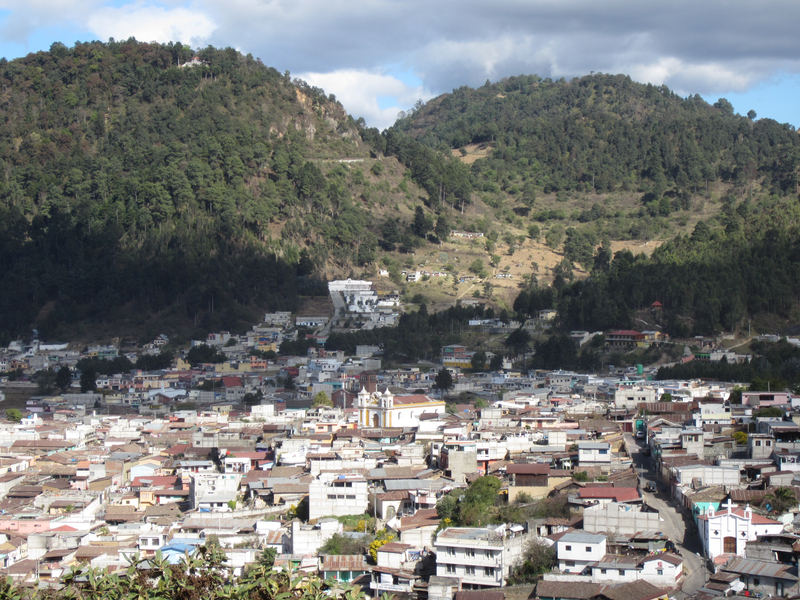 Here you can see how Xela is a valley surrounded by lush green mountains and volcanoes. The land of eternal Spring! Views from the street. Reminds me of San Francisco. 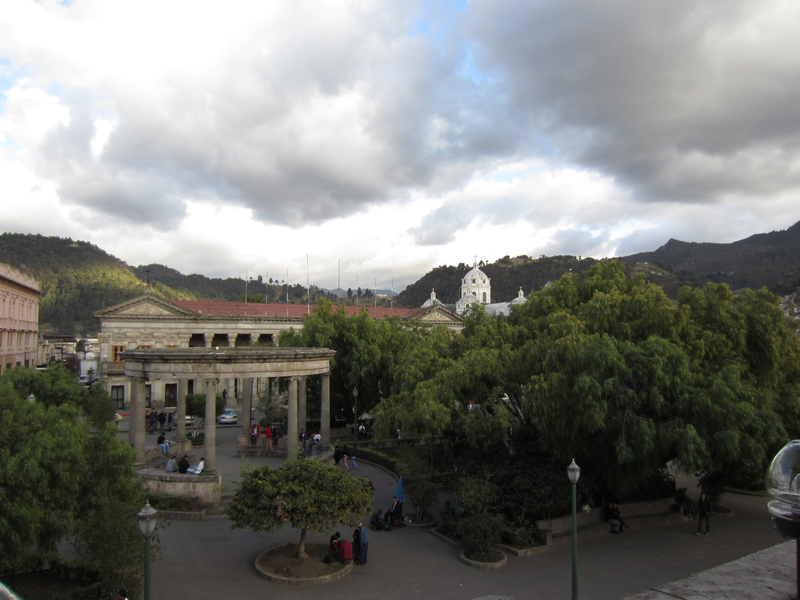 View of the main square in town, Parque Centroamerica, only four short blocks away from my home for the week. 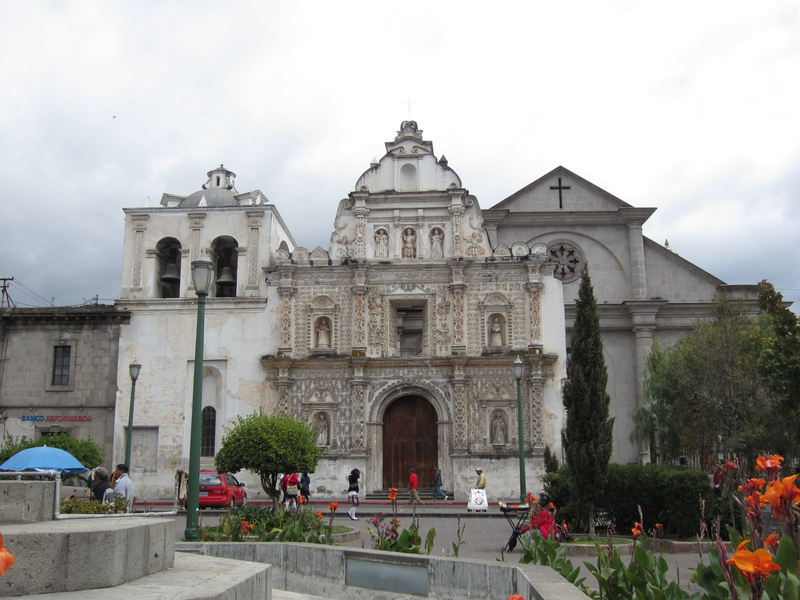 And the centerpiece of Parque Centroamerica, the cathedral, Espiritu Santo. 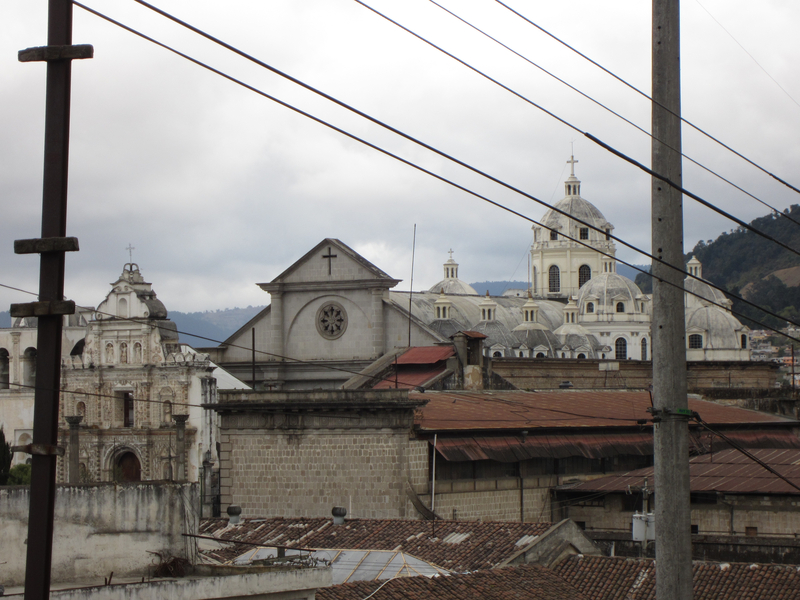 The catedral consists of two structures. The “Espiritu Santo” parish’s ancient facade (1535/1896) and to the back the “Diócesis de los Altos” (1899). 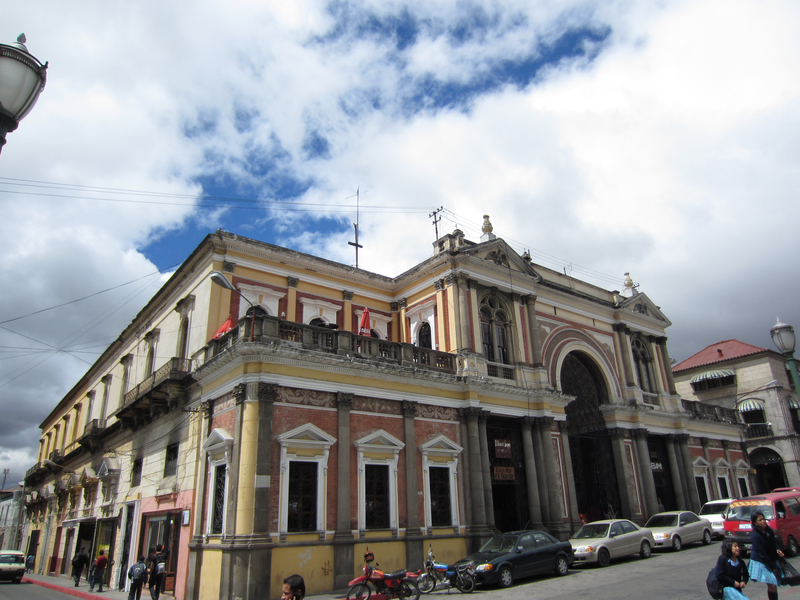 Another historical building on the opposite side of the church in the Parque Centroamerica. The bottom is full of bars, however, all good travelers need a good perch. I found mine on the top lefthand side at El balcon de Enrique, where I went every early evening for my glass of Chilean red wine and an overview of the city! Some more shots of the heart of the city. I blissfully fell off to sleep in a deep slumber and remained sound asleep until one in the morning. The cute, adorable yellow lab was outside my window barking at the top of her lungs for the next hour. Yet another cultural thing I had to get used to! In went the ear plugs, on went the iPad White Noise at full blast and over my head went my pillow. 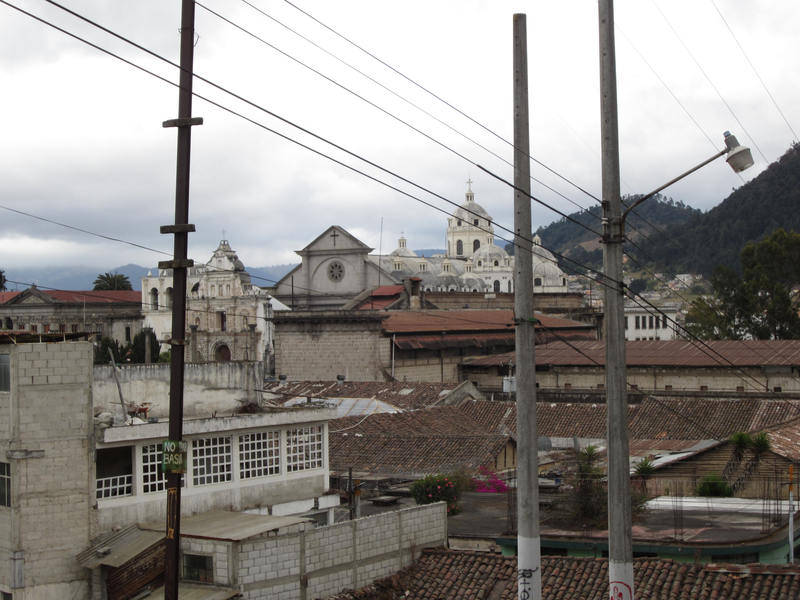 Somehow I was able to drown out the noises and life of Guatemala and fall back into a fitful night’s sleep. Stay tuned….How would my first day of Spanish immersion go? Would I learn how to communicate with my hosts? You’ll have to wait and see! I love how you used the term “gunfire Spanish”. That’s exactly how I felt when I first landed in Spain, it was just so hard to keep up with everyone! I found the speed of the Spanish insane! They speak so fast and roll those r’s like nothing while I struggled to try to catch at least a word here or there. When people spoke slower, I actually was able to udnerstand 80% by the end of the week! Not bad for only five days of Spanish class! Thanks James! Yes, it was a crazy experience! They sure speak fast, especially in a large group! Like the pics of Xela Nicole! I, too, love the “gunfire Spanish” image. This post is especially fun since you are living with a family and sharing their lives with us. You are less of an observer/tourist and more of a participant in the culture. Can’t wait for more. Hope you enjoy this wonderfully warm weekend! Thanks for the comment Kathy! I really love the experience of “living” in another country for a week as opposed to simply being a tourist. 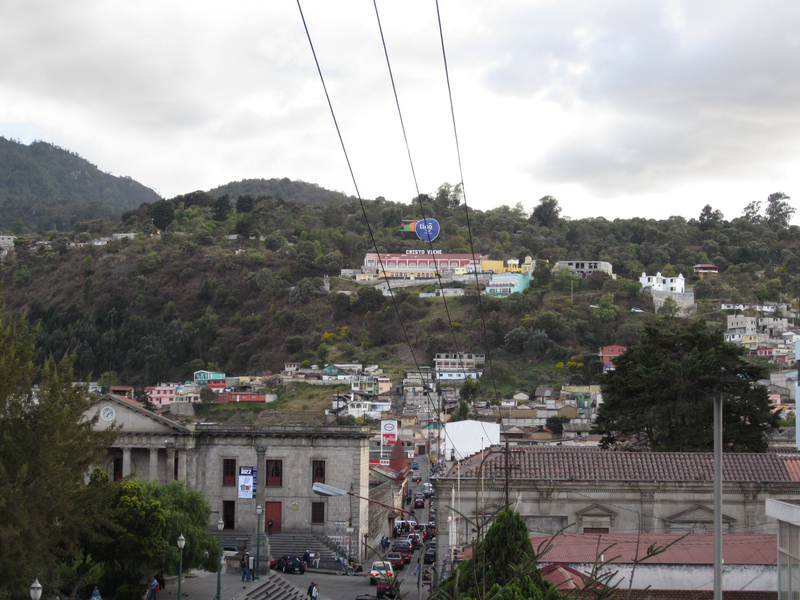 China was more of being a tourist and it had no where near the same impact as Guatemala did on me.